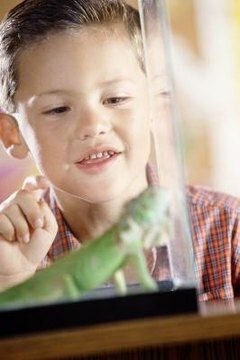 Designing an elaborate reptile terrarium is a creative experience; you want your habitat to stand out and be unique. The only constraints on cage design are your pet's needs, your budget and imagination. It is possible to custom-build artificial props, incorporate unusual plants, conceal apparatuses and install natural-looking feeding devices when establishing your terrarium. Rocks look fantastic in desert-style terrariums, but they have a number of drawbacks: they are heavy, they are not easily customized to your cage and they can harbor pathogens or pests. Instead, create your own rocks by using a combination of polystyrene, sand and plaster or grout. Carve the polystyrene into the shape you desire and then cover it with several layers of non-toxic plaster or grout and then place sand on top of the adhesive. To create realistic-looking rocks, use several different colors of sand on each rock. You can also create logs, branches, cliff walls or bark-like cage backgrounds by using the same technique, but add coco fiber, bark or moss on top of the adhesive, instead of sand. Extremely elaborate reptile cages may occasionally require that you house a pump, filter or control device inside the cage. To prevent these items from ruining the aesthetics of your otherwise natural-looking terrarium, use a small hollow log to hide them. After finding and cleaning a suitable hollow long, cut it in half lengthwise. Attach two small, black or brown hinges along one side of the cut; you now have a hollow log that opens like a trunk. Drill holes in inconspicuous locations to route cords and tubes and use expanding foam to seal each end of the log and prevent your pet from gaining entry. If the weight of the log is not enough to keep your pet from opening it, install a small hasp in a hidden location. Tortoises can be very hard on their habitat, and will quickly destroy most elaborate cage props you include in their cage. Rather than spending your time trying to prevent your tortoise from trampling and eating the plants in his cage, provide him with plants that you can replace easily. You can “plant” bird seed directly into the cage substrate or in small, dirt-filled pans that are placed inside the habitat. Water the seeds regularly, and in a few days, the seeds will sprout into a wide variety of weeds and grasses. Not only does this provide decoration, hiding spots and better air quality for your pet, it also provides him with something to munch on between feedings. Drill a 1/2-inch hole several inches from one end of a section of 1-inch PVC pipe, and then -- while leaving the drilled hole open -- glue moss, coco fiber or bark around the rest of the pipe. Place the pipe vertically in the cage so that it resembles a small tree; press the bottom of the pipe down several inches into the substrate to keep it stable, but be sure the drilled hole is still above the top of the substrate. When it is time to feed your lizard, dump a few crickets into the top of the pipe; the crickets will slowly find their way out of the hole, just as they may crawl out of a hollow tree in the forest. Over time, your lizard may learn to anticipate feeding in this manner, and “beg” for food by waiting near the hole.